My boss Jenny’s latest Forbes article on Trust I think arises from research our team has been doing in leadership and building enterprise trust scores. Truly, pardon the pun, Jenny confirms what she already has been practicing regarding building trust in virtual teams herself. This article uses real-life observations that she walks her talk. Here are two major business benefits that I have seen from her leadership of our virtual L&D team at SAP: higher productivity and better hires. 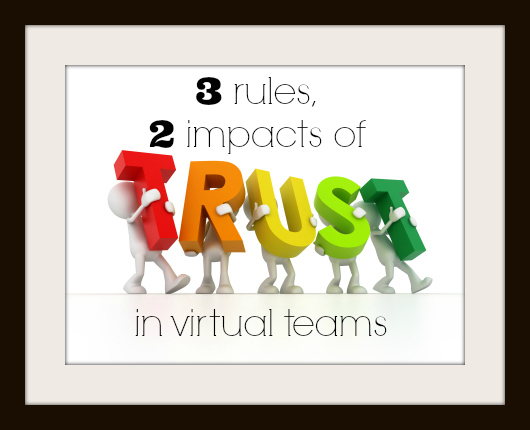 The key to higher productivity on our virtual team is trust. For Jenny, there are three key building blocks for trust: giving trust first, communicating effectively, and being genuine. True to her word, Jenny extended trust first, asking us to complete high-visibility tasks, then trusting us to get it done with minimal oversight. She has not been disappointed. As a learning team at SAP, first in the sales line of business and now with global responsibilities in the HR line of business, we have won numerous awards. Reciprocity is important to this concept. She extends trust to us, we respond in trust with our best efforts, and she responds with the support of a mathematical statistician and an awards expert to help us put our best business case forward to present our efforts to our professional organizations. Hence the awards: Her trust fuels our efforts, our efforts respond to her trust; and she reciprocates with professional support. And we trust her more, and do more. It’s no wonder so many of us within SAP support her so passionately. In another trust exercise, we welcome newcomers and involve them in our Google Hangout lunches, where we spend time face to face over video, with one rule: no talking about work. The hangout and the rule have one purpose: fostering personal connections between us, so that in times of dispute, we trust each other enough to resolve our differences with more collaboration than contention. There can be such a huge productivity boost in it for an organization, if the organization can trust their people. Workplaces with higher trust (measured on employee surveys) tend to have higher employee retention. 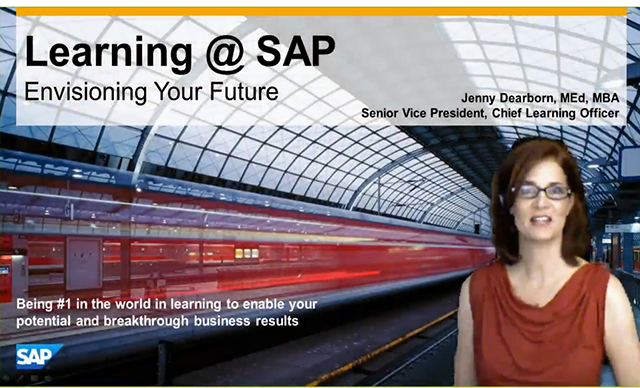 Jenny Dearborn presents the Future of Learning at SAP during one of her roughly fortnightly Coffee Talks. As the first Chief Learning Officer in SAP’s history, Jenny has a large task in front of her to communicate with the 62,000+ employees she supports. Key to her task is communicating effectively with the line of business executives she enables. So she provides virtual coffee corners using a particular studio that allows her to communicate as though it’s a TED talk, asking to tell her who we are, and asking often for opinions from her audience. We stay engaged, fueling the chat stream with suggestions, questions, and points of discussion. What a neat place to be, in a discussion with Jenny about our industry. Jenny shares her real personality with us in everything she does. If you follow her twitter feed, thoughtful business articles on learning and business impact are mixed in with family tweets, most recently encouraging and cheering on her husband in his cycle race. She often responds to our group’s humorous email threads with videos and meme images of her own; she carves time out of her schedule to have skip-level meetings with her work family when we request them, despite traveling all over the world to meet with learning executives to change the world of learning at their companies as well. So many of us have received mentoring from her in little ways and large ways, refining our individuality at work and growing us as professionals in our field. From what I’ve observed, this trust cycle becomes the opposite of a vicious cycle… perhaps a benevolent cycle? As she trusts us first, we trust her and produce, she trusts us with more, we produce more… and so on. Imagine what the life is like for employees, when trust is absent! I don’t know how many of you know this, but there is a coming 2020 workforce shortage. In case you haven’t heard, the coming workforce shortage will occur when more jobs are open than there are degreed professionals to fill them. Our team is almost 100% virtual – my colleagues work from the Bay Area, Seattle, New Orleans, Denver, Dallas – even Canada, Germany (of course) and Ireland as well. Jenny has cherry-picked professionals from all over the world to compose her team, because she refuses to be constrained to what’s available to her locally. As a result, she’s gotten a team that won multiple awards in at least five separate industry award competitions, just in 2013. The future’s so bright… we’re excited about what we’re increasingly able to influence within SAP, within our industry, in our communities and across the globe. How do you see trust affecting your environment at work? Is it due to one of the factors mentioned above, or do you see additional factors? What other business benefits have you seen from trust at work, whether virtual or on-premise?